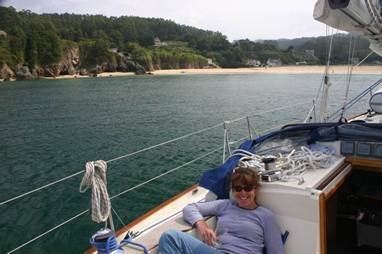 We left our lovely calm anchorage at Vivero and motored sailed around to the next Ria, Ria Del Barquero, where we anchored off a beautiful beach for lunch. There was a slight swell so it wouldn’t have been a good place to spend the night. After lunch we continued around to Ria de Santa Marta de Ortigueira and anchored off the little harbour at Espasante. Having not seen another boat all day, we were re-assured to see another boat lying in the anchorage. The boat geek in Alan quickly recognised it as Aremiti, the Westerly ketch we were moored beside on the Ile d’Yeu. Knowing that Chris and Julia have been round the world we felt very safe in our choice of anchorage and soon after the anchor had set we were enjoying drinks onboard Aremiti. We returned to Stella later in the evening just as the swell started to build. Although there was no wind all night the swell didn’t go away. The combination of the endless rolling and a very hungry mosquito in the cabin meant that neither of us got much sleep. This morning we picked up the anchor and were gone by 0930h, 30 minutes after Aremiti, both headed for Cedeira and the hope of a more peaceful night.